Sony Ericsson had a great night when the Swedish Design Awards 2008 was held at Moderna Museet in Stockholm. 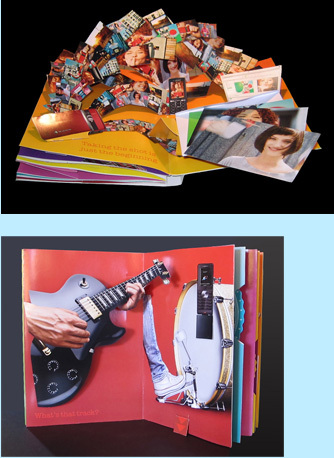 The pop-up book, produced by Product Communication of C&D in Lund, won the gold medal in two categories – Information Print and The Jury’s Award. The jury’s motivation: Every spread is a world of its own. A surprising mix of nostalgia and futurism. It takes guts by the involved people to pull through an idea like this. We find new surprises every time we open the pop-up book. The pop-up book was handed out to visitors at the 3GSM World Congress in February this year. The ambition was to create a book that caught the unique Sony Ericsson user experience in a fun and inspiring way. Four paper engineers from the USA and the Netherlands, with long experiences in creating pop-up books for children, worked together with a small team from Product Communication to come up with exciting solutions for each spread. Sony Ericsson also received a silver medal in the category Information Print – Manual for the G900 Quick Guide. The Swedish Design Awards/Svenska Designpriset is a competition in graphic design arranged by Batteri Kommunikation AB together with the magazine CAP&Design. The competition is held each year and this year, 150 nominees competed for the gold and silver medals of 18 categories. The Sony Ericsson Pop-up Book was team-engineered on site in Copenhagen, Denmark by Andrew Baron, Kees Moerbeek, Kyle Olmon and Sally Gabb.